Picture courtesy of Reg Godwin, -"Watkins Guitar World" website. 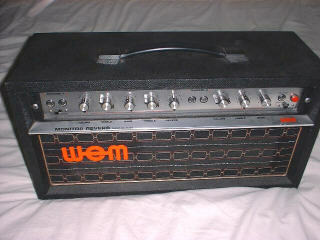 The "Monitor" name surfaced again in the 1970s in the forms of a 50W head and a 2 x 12 combo which was styled very like the Dominator Mk III. A 2-channel 4-input model with treble boost and Hammond reverb on one channel.